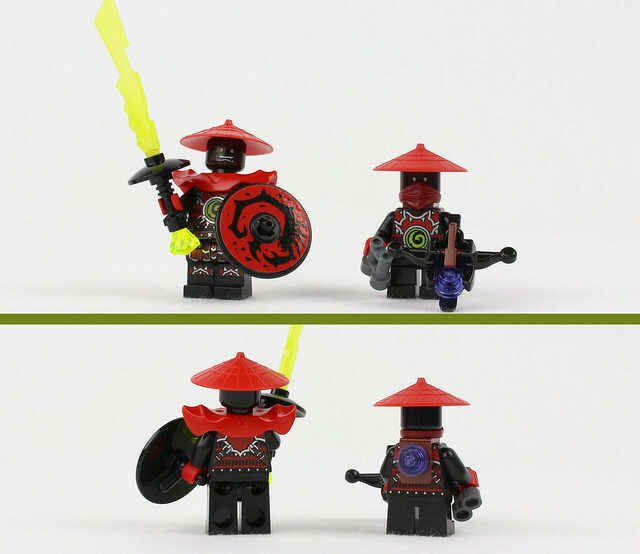 While the new LEGO Ninjago sets are just hitting stores, we wanted to finish up our reviews of the previous wave of sets. 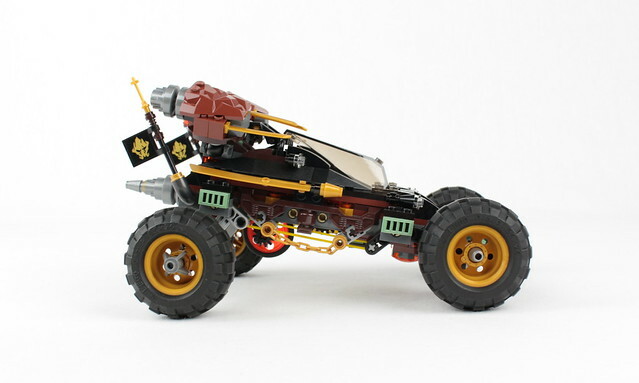 One such set is the Ninjago Rock Roader. Priced at $40.00 and containing 406 pieces, this set contains your usual 10-cent-per-piece. 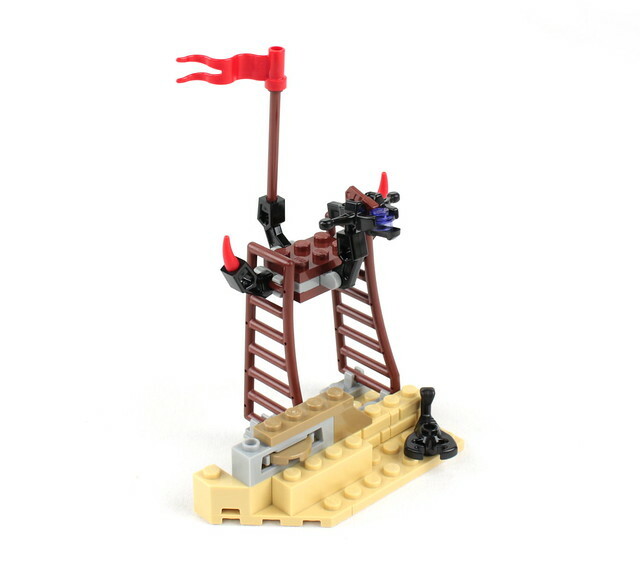 This set ranks near the top of my favorite sets for its functionality and playfulness. Read on to discover why! First, we'll start off with the minifigures. 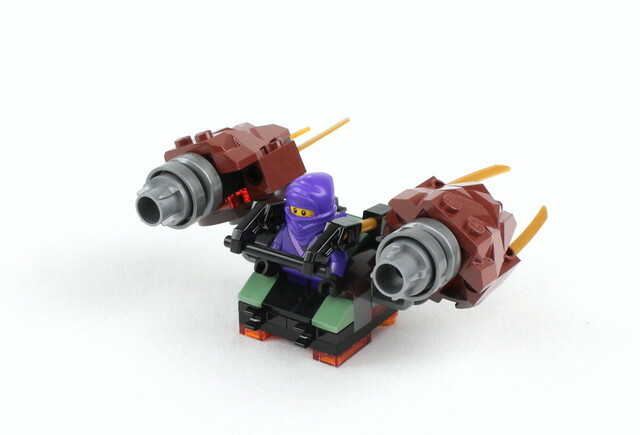 The purple ninja is exclusive to this set, and this is one of the two minifigures that contains a purple ninja hood (the other being in a fantasy minifigure set). However, the purple color of this minifig, and the printed back (it contains a piece of paper pinned to the shirt), might also limit its versatility. 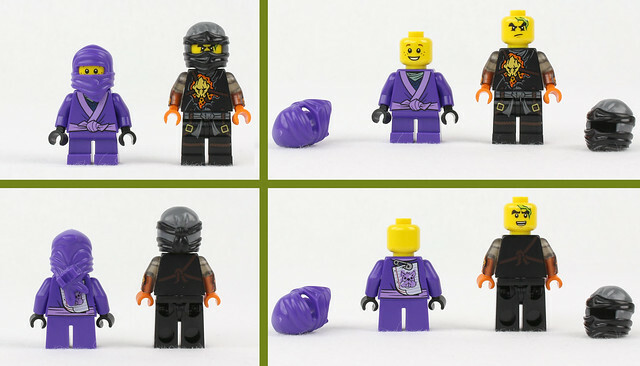 Unfortunately, the purple ninja does not have a unique face print. Cole (Cole RX to be exact) is also a figure that is exclusive to this set. One of the first things to notice about this figure is his trans-black arms, complete with meteor-like printing near his hands. The torso is also unique to this figure, but the legs and the head are identical to the Cole minifigure in the Ultra Stealth Raider. All-in-all, these two figures are very nicely printed, and are a good addition to your minifig collection. Next, we have the villians in this set. These two are stone warriors and are, in my opinion, superior to the original stone warriors. This is primarily because their printing is on a black torso rather than a grey one. I personally think this looks a lot better. Along with the detailed legs the taller stone army minifig has, these torsos look great for medieval knights. In fact, that is one of the reasons I really like these two minifigs. Additionally, these minifigs come with some awesome accessories, including a new crossbow, a (stickered) shield, red armor, and a dark red mask. We now move on to the builds. Before getting to the Rock Roader, however, we must first look at the small little watchtower. While nothing too special, it does contain some nice pieces, including sand masonry bricks, brown ladder pieces, a scorpion, a red flag, and one of the fairly new disk shooter bricks. All right, that was quick. Now, for the Rock Roader. 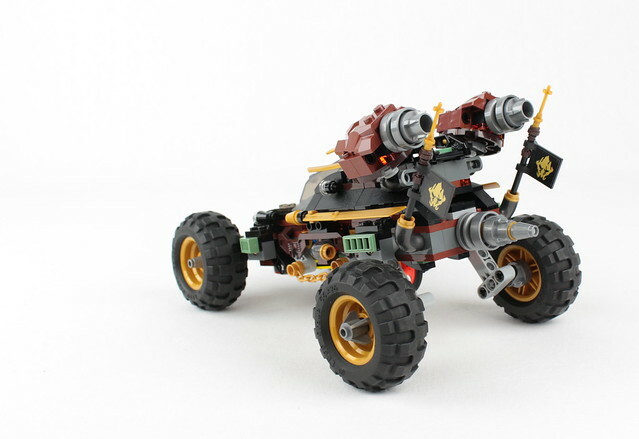 This vehicle was obviously inspired by dune buggies, and this one looks and "feels" like one (it has a nice bit of springiness to it). 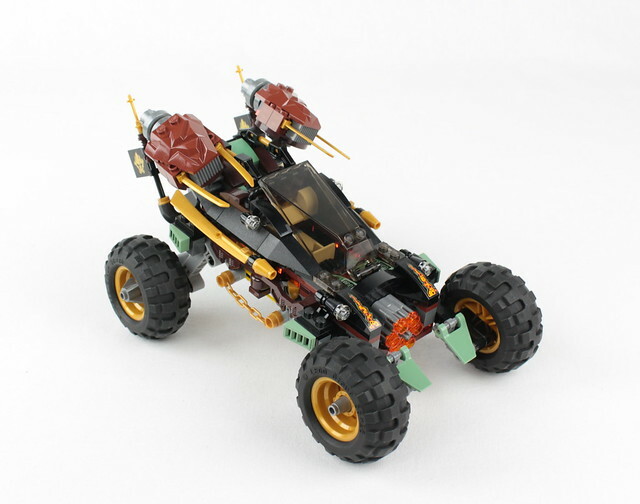 There isn't really a weak side to this vehicle, as the creators added detail to each side, although some could argue that from the side, you can see all the complex Technic stuff. 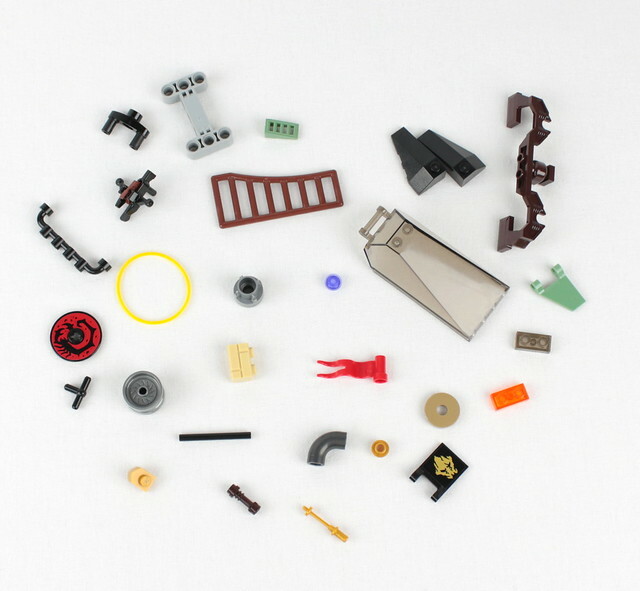 While it may not contain "moc aesthetic quality," it is certainly superior in its structure, functionality, and design for a set. I really like the way the creators of this set added the decorative train piece to the sides of this vehicle instead of using the usual overhang plates. The addition of the gold chains was a nice touch as well. Another really neat design of this set is in the way the designers added clip hinges to secure the wheels. I also like the elbow pieces in pearl dark gray near the back with the flags. While the flags are not printed, they still look nice and seem generic enough to add them to your own armies. The dark brown lightsaber handles and gold skis are also very useful pieces. There are two major functions this set contains, the first is shown below. There is a small, flying "ship" that detaches from the back of the Rock Roader. This function is ok at best. While it is implemented nicely, I feel the ship's design is weak. ...it translates that rotating motion to the stud shooter, and it fires out the studs! This was very, very well-designed, so kudos to the designers! I had loads of fun with this (we can always be kids at heart right?). 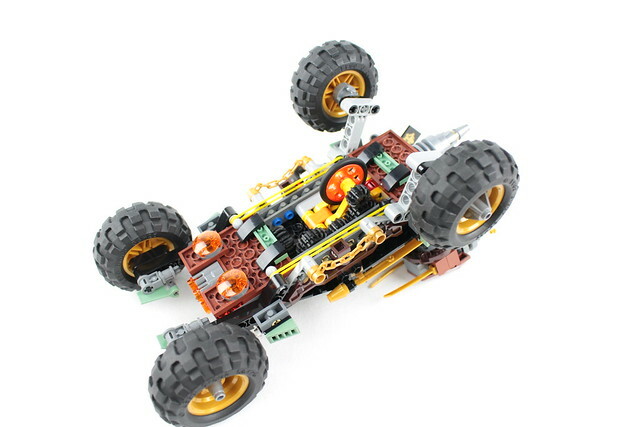 Overall, this set contains some really great functionality and play-ability aspects to it that I would encourage parents to pick up this set for their kids. Even I as an adult had fun playing with this set - with its nice shocks and stud shooter function. I could almost imagine my younger cousin having tons of fun with this set. 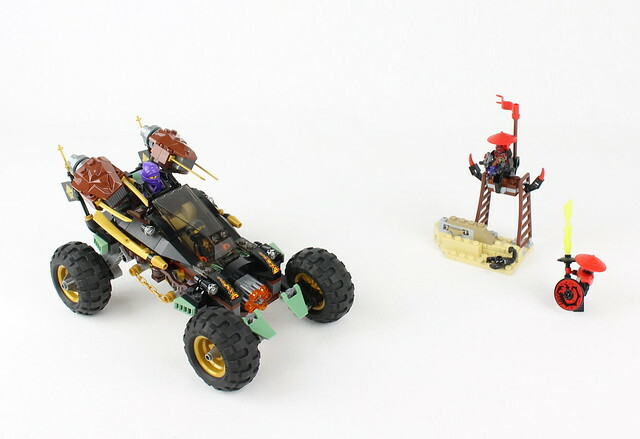 As for the "MOCcer" world, this set contains quite a decent amount of useful pieces, such as the thick droid arms, the 1x1 tiles with pin, the sand green flags, the black ice cream cones, and the nice canopy piece, plus those mentioned already in the review. Of course, the opinions expressed in this review are my own. Thanks again to the LCE team for providing the set for us to review. I hope you enjoyed it! Feel free to leave your thoughts and comments below.